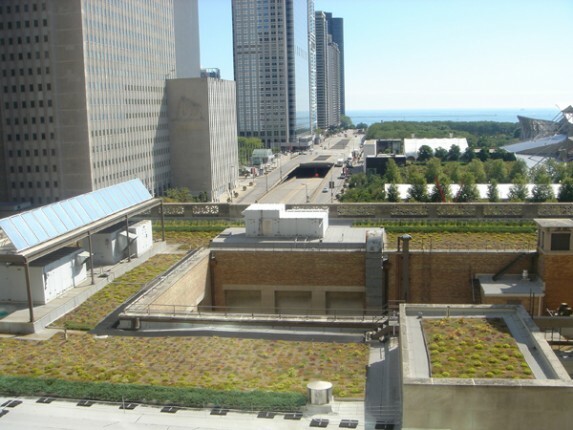 This project at Chicago’s Cultural Center involved the replacement of the existing roof and the subsequent installation of a green roof and solar collector panels. 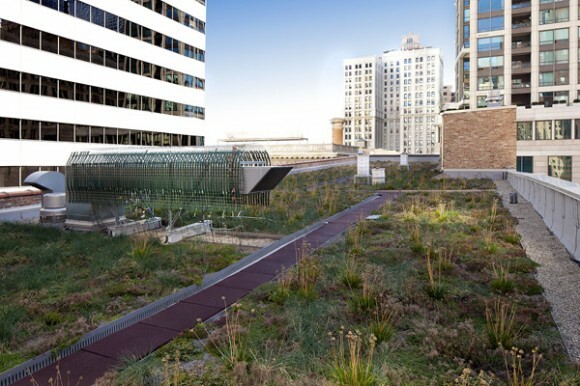 One of the major challenges that faced this undertaking was determining how to accommodate the weight of a green roof on a structure designed in 1897. The solution devised was to post tension the existing trusses by installing a cable system and a king post to each truss. This installation allowed the trusses to be cambered in order to sustain the additional load. Bauer Latoza Studio developed various planting schemes that took into consideration the historic nature of the building. 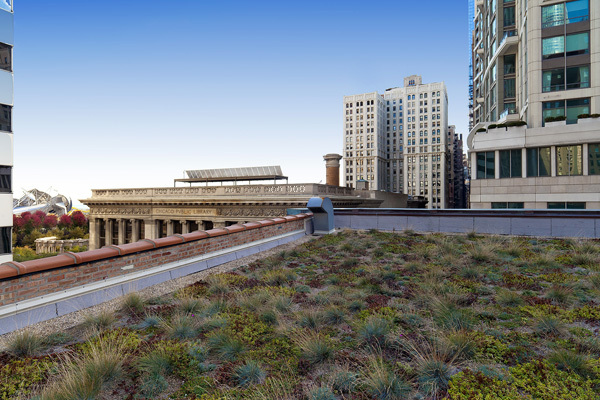 The plant material selection focused on sustainability and variety in order to provide four-season interest for this highly visible roof. The multiple-level roof also contained various pieces of mechanical equipment which dominated the space when viewed from above. To overcome this, Bauer Latoza Studio designed canopies to be placed over the equipment and planted with sustainable vegetation. These canopies not only visually screen the equipment but also protect them from the elements. 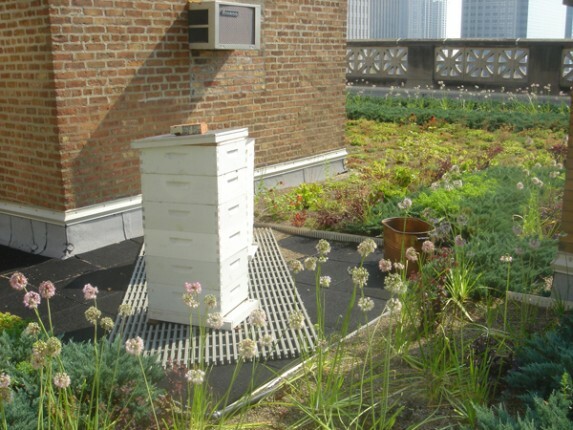 Along with the green roof, solar collectors were added to provide hot water to the building. The green roof covers approximately 21,000 square feet of the roof’s entire 45,600 square feet. 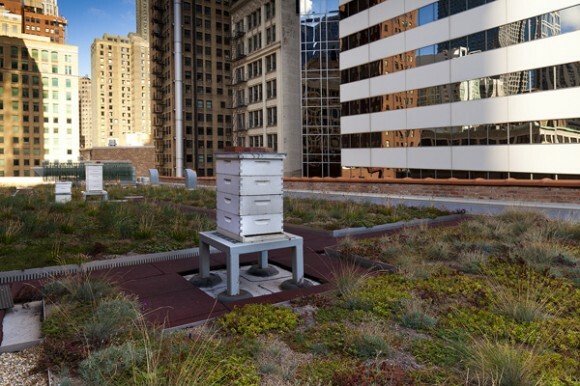 Following the successful completion of the Cultural Center Green Roof, the City of Chicago commissioned Bauer Latoza Studio to implement a similar system at Gallery 37 Center for the Arts. 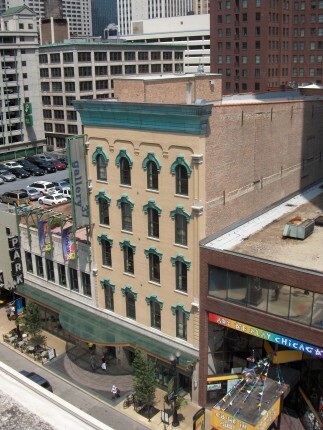 This building is also an historic structure, which required a unique solution. The solution supplements the existing structure in an aesthetically sensitive manner for the exposed ceilings in the gallery space immediately below. With the exception of the elevator penthouse enclosures, the green roof covers the entire roof of the 5-story portion of Gallery 37 totaling 6,000 square feet.